This article contains step by step instructions on how to remove BitLocker Protection on the system drive C: in order to be able to clean install Windows 10 on a BitLocker protected computer, if you don't have the BitLocker Recovery key or the BitLocker password or if you cannot unlock the BitLocker drive for any reason. When a Windows 10 device (laptop or PC) is protected with the BitLocker, then the only way to access its contents or to reset the device (by using the "Reset This PC", "Refresh your PC" features), or to reinstall Windows, is to unlock the operating system drive C: by using the BitLocker Recovery Key or the BitLocker password. If you don't have the BitLocker Recovery key or the BitLocker password to unlock the system drive C:, or the BitLocker key is not accepted, then the only option you left (unfortunately), is to fully erase the drive and to perform a clean Windows installation. In this tutorial you 'll find instructions on how to resolve the following problem when trying to install Windows 10 or to reset a Windows 10 device at its factory default state: "The drive where Windows is installed is locked. Unlock the drive and try again". Requirement: A Windows 10 Installation Media (USB or DVD). If you don’t own a Windows Installation Media then you can create one by using Microsoft’s Media Creation tool. How to create a Windows 10 DVD installation media. * CAUTION: THE BELOW PROCEDURE WILL DELETE ALL THE STORED DATA ON THE LOCKED DRIVE. PROCEED ONLY IF YOU CANNOT UNLOCK THE BITLOCKER PROTECTED DRIVE/COMPUTER. Method 1: After Power On, press the corresponding Function key (commonly is the "F12" or the "F8" key) to view the "Boot Order" or "Boot Menu" options. Then select the USB (or the DVD) device which contains the Windows installation Media (files) and hit Enter. 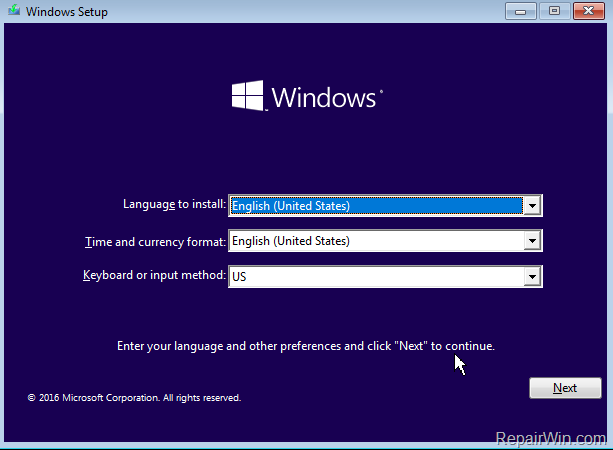 Method 2: Enter BIOS Setup (Settings) and set the Windows Installation Media as the "First Boot Device" at "Boot Order" menu. Then Save and Exit from BIOS settings. * Note: If you prompted for the recovery key, click SKIP this drive. * e.g. At the below screenshot the "Volume 2" has the larger size. 6. Type exit to close DISKPART tool and then close Command Prompt. 7. Turn Off and then Turn ON your device again. 8. Boot from the Windows Installation Media. 9. Click Next and then Install Now. 10. Choose "I don't have a product key" and then accept the License agreement. 11. 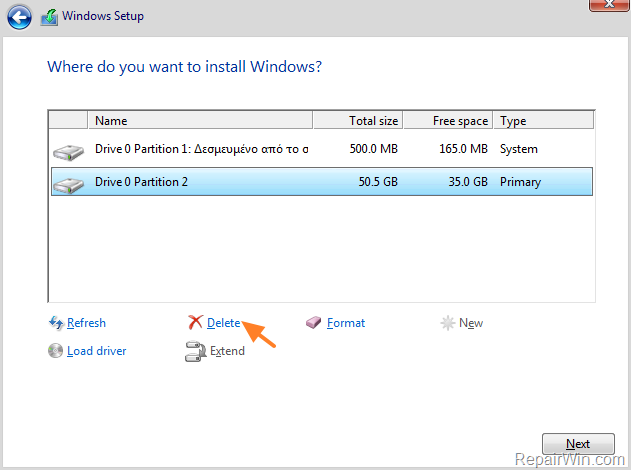 Select "Custom install" and then delete all the rest partitions/volumes on the disk. 12. 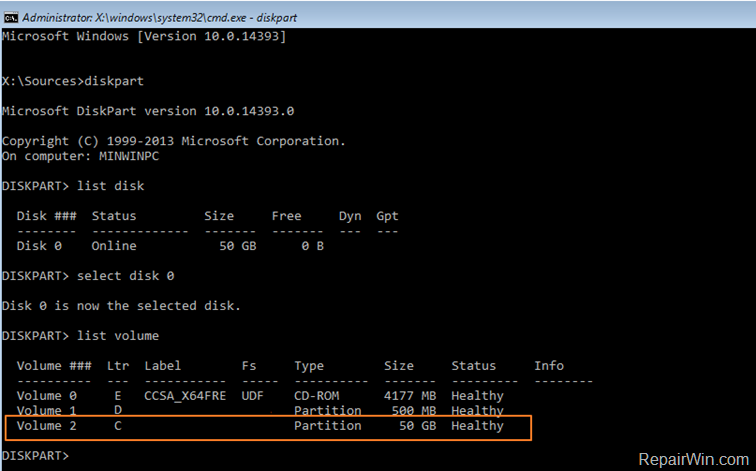 When done, choose the "Unallocated space" and click Next. 13. Follow the on-screen prompts to clean install Windows 10. « How to Disable Bitlocker in Windows Recovery Environment (WinRE). » How to Disable BitLocker in Windows 10.